← Cycling is (or should be) FUN! Many town and city centres in Britain have extensive pedestrianised areas. Often these areas will be surrounded by busy distributor roads, designed to accommodate the motor traffic that has been excluded from the pedestrianised streets (and which in practice have served to induce demand for driving within urban areas). Given the hostility of these roads for those on bikes, it is not surprising that pedestrianised areas are attractive routes for cycling, even when (as is often the case) cycling is illegal within them. Pedestrianised streets are also important routes and destinations in their own right. So should cycling be allowed in pedestrianised areas? Pedestrian precincts can be found in many city centres. Although this measure was prompted by the annoying presence of motorised traffic, many of these precincts are now only open to pedestrians, in order to create a pleasant and safe shopping atmosphere. However, the question is whether it is always necessary to prohibit bicycles as well as motorised traffic. After all, compared to the latter, cyclists cause hardly any nuisance. Another issue is that central areas and pedestrian precincts that are closed to cyclists often form a major barrier. Furthermore, these areas also accommodate a great many destination points for cyclists. Bicycle-friendly policy ensures that these destinations remain accessible to cyclists. The manual then suggests that bicycle and pedestrian traffic can be combined if the number of pedestrians, per metre of route width, is below 200 per hour. (To take an example, for a ten-metre-wide shopping street, this would amount to 2000 pedestrians per hour walking past an imaginary fixed line on the street.) Above this level, the CROW manual does not recommend allowing cycling on these streets. For pedestrian volumes of less than 100 per hour, per metre of route width, the CROW manual recommends ‘full combination’ – that is, just allowing cycling on a pedestrianised street, without any delineation. Between 100 and 200 pedestrians per hour, per metre, it recommends a marking out of a cycle route, with or without height difference, depending on pedestrian volume. We have practical examples of this in the UK. East Street, in Horsham, is now closed to motor vehicles between 10:30am and 4:30pm each day, but with cycling still permitted. For these six hours, it’s a pedestrianised area, with cycling in it. After two years, there hasn’t been a single incident involving cycling, or complaint (as far as I am aware). There have been only two (slight) pedestrian injuries, both involving motor vehicles, outside of the ‘pedestrianised’ hours. It works well. However the background assumption in the UK seems to be that cycling is ‘a problem’, that needs to be clamped down on, and eradicated in pedestrian areas, even where there is scope for its introduction. Cycling is banned on Guildford High Street during the day, for instance, despite this being a very wide street (and despite it forming part of the National Cycle Network). 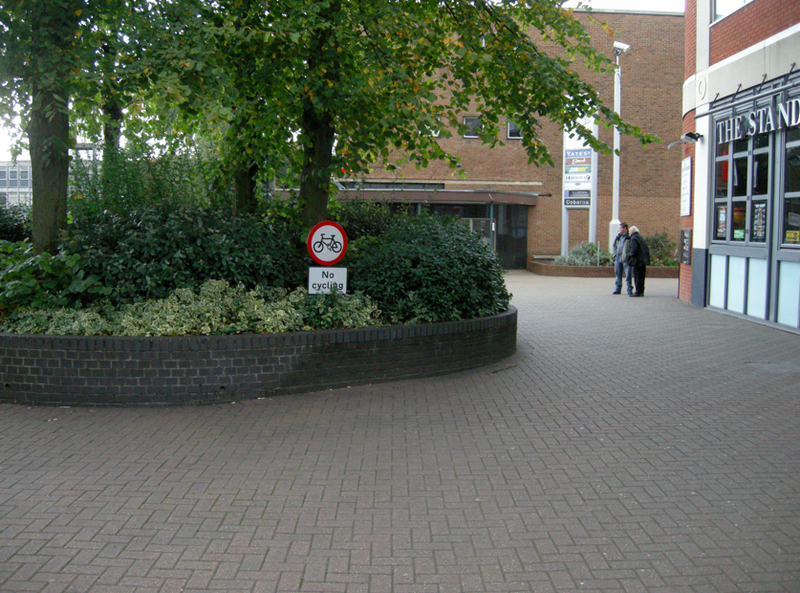 Cycling is also banned, entirely, in the centre of Stevenage. And there are doubtless many other examples. Councillors in Peterborough are agitating for a complete ban on cycling in the town centre. The rationale for these bans – or the refusal to lift them – is usually a single incident (or even just an anecdote) about a near miss, or a collision, involving a pedestrian and a someone cycling. This is a poor basis for making policy, and, if applied to the road network as a whole, would lead to the wholesale closure of roads to motor vehicles. Amazingly enough, we actually have some pretty good Department for Transport recommendations on cycling in pedestrian areas, that date back to 1993 – TAL 9/93 [pdf]. This guidance was itself informed by a Transport Research Laboratory study, PR15, Cycling in Pedestrian Areas – conducted at a time when the TRL was an executive arm of the DfT. That study was based on hour-long footage of 21 pedestrianised sites – 12 in Britain (Beeston, Bristol, Cambridge, Canterbury, Chichester, Leicester, Manchester, Nottingham, Oxford, Peterborough (2) and York) and 9 in Europe (3 each in Denmark, Germany and the Netherlands), followed up by 12 hour video recording sessions at four British sites, and questionnaires. There are some very interesting findings. In 66 hours of total footage, not a single collision between a cyclist and a pedestrian was observed. Not one accident involving an adult pedestrian and a cyclist was recorded at any of 21 sites in the previous fifteen years. 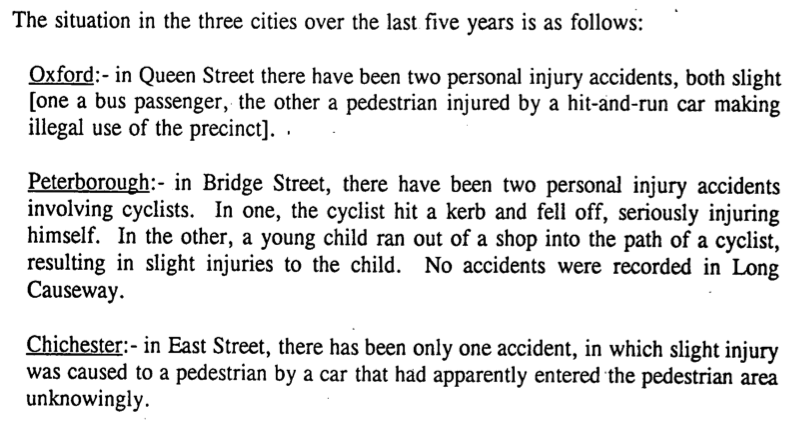 There had been only one accident involving a child pedestrian and a cyclist in that fifteen year period. Cyclists adapt their speed to pedestrian density, and dismount if necessary. While pedestrians tend to adapt their behaviour in the presence of motor vehicles, they do not do so in the presence of cyclists. Observation revealed no real factors to justify excluding cyclists from pedestrianised areas, suggesting that cycling could be more widely permitted without detriment to pedestrians. The study contains some interesting data on how people cycling behave, particularly in those study areas where cycling is not permitted. 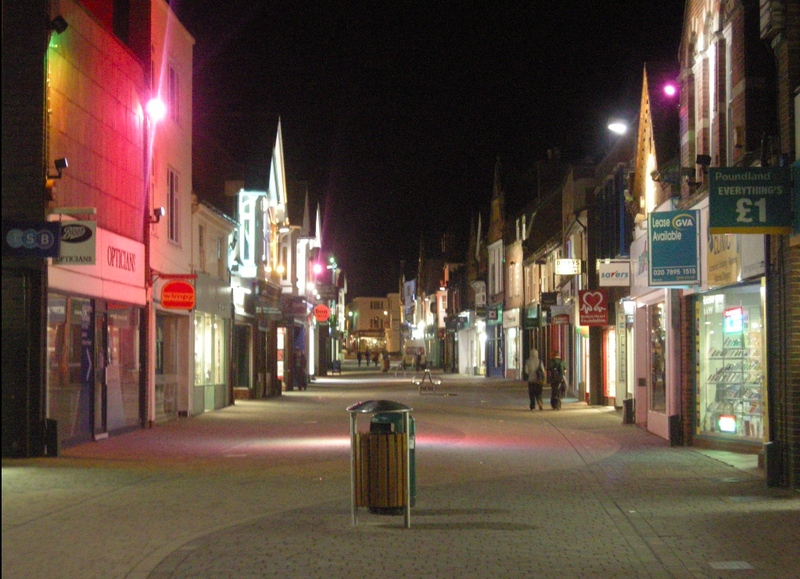 One example is East Street in Chichester, which had a formal ban at all times in 1993, when the study was conducted. I’ve graphed the data below. What is really noteworthy here is how people cycling behave. At the start and end of the day, very few people are dismounting (the blue line) – despite cycling being illegal. As the day progresses, however, the number of people dismounting increases, with almost everyone choosing to dismount in the middle of the day. There is a clear match here between dismounting rates (in blue) and the number of pedestrians on the street, per hour (the red line). When the street is busiest with people (with several thousand people walking along it, per hour) almost everyone is dismounting. 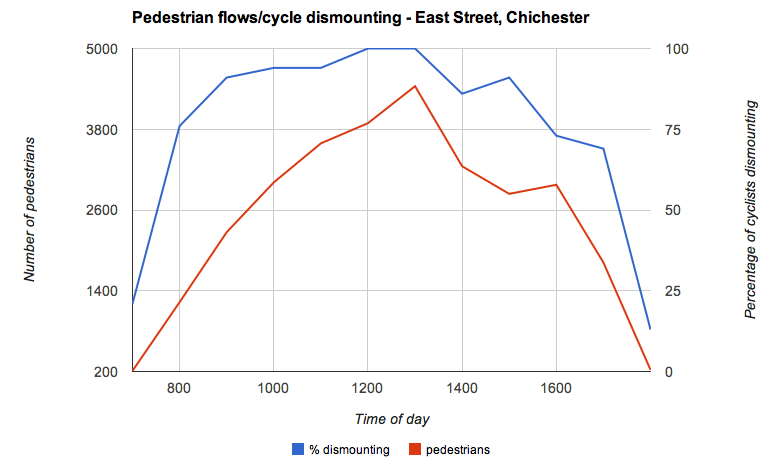 Conversely when the street is much more empty (with around a thousand people walking along it per hour, or less) the dismount rates are much lower. These patterns are repeated throughout the other British and European study sites in the TRL report, whether cycling is legal or not, suggesting that the governing factor on whether people choose to dismount or not was not legality, but the density of pedestrians on the street. Indeed, it’s these densities that inform the CROW guidance on whether cycling should be allowed, or not. Lunchtime. Even if cycling were legal here, would you bother under these conditions? The same street, at 7pm. Still illegal to cycle here – but any reason why it shouldn’t be allowed? The standout message, therefore, is that cycling behaviour naturally adapts itself to pedestrian environments. Rather than clampdowns and enforcement, perhaps we should be moving to trials of cycling in pedestrian areas, and examining how people behave and respond. The evidence shows that we can trust people to make the right decisions. This entry was posted in Pedestrianisation. Bookmark the permalink. I’d add one more factor here. Is the street a destination for the cyclist or is it a route to somewhere else. I’d suggest this also affects the behaviour of the cyclist and might be particularly important in large places like London. The implication being that the cyclist using it as a route will want to get on with it and get to wherever else they’re going. The point about sensible behaviour and decision making almost certainly applies to other areas as well. I would expect that most cyclists who are apparently breaking the law by doing things like jumping red lights are doing so still with due regard to their own safety. The stats ought to show that up with relatively few accidents caused by cyclists red-light jumping. Common sense ought to apply (from powers that be, and people on bikes). When a pedestrianised street is chocka with pedestrians, daft to try and cycle. Northumberland St in Newcastle is good example. When busy I don’t cycle on it (despite it being very wide; it’s the former A1) but, at night, I do. Technically I can’t cycle on it and some folks will challenge: they don’t ever challenge the vans and cars using the pedestrianised zone as an out of hours loading area. The history angle (I always have a history angle) is that pedestrian “precincts” were dreamt up by Sir Alker Tripp (a Metropolitan police chief, and, get this, poster artist) in 1940s and 50s, and then taken up by Buchanan in the highly-influential 1960s ‘Traffic in Towns’ report. This talked of separation of pedestrians and motor vehicles but largely discounted cycling. Cycling was assumed to be a mode in terminal decline with no need to cater for it in any way shape or form. Buchanan said that explicitly in the report. ‘Traffic in Towns’ also gave us all those lovely urban motorways. Deal was: pedestrians get city centres, motorists get flyovers and ring-roads. Didn’t quite work out that way. But that’s the legacy we’re left with, with cycling often in limbo land. Regs need updating. The law’s never simple so there are a few caveats, but from my reading it seems that it’s not the case that footways away from a road are available to cyclists. I’m happy to be corrected if I’m wrong, too. “Q: When is cycling allowed in pedestrian precincts? The latter is particularly interesting, as it suggests pavement cycling may be legal where the street forms part of a “core path” – there’s also some insight into GCC’s “dual networks” mindset too. Yeah, core paths are one of the caveats. Whether by accident or design Scottish councils are often having to relax their restrictions on cycling once they designate a road as a core path. As mentioned below, this has happened in The Meadows in Edinburgh and in the city centre in Glasgow, and plenty of other places besides. If you ever come across a footpath or pedestrianised road in Scotland that doesn’t allow cycling, it’s definitely worth checking the local council’s core paths plan. If it’s a core path, the signs are wrong. You show Guildford High Street as an example where cycling is prohibited but it is probably not a good example if it is intended to illustrate a place where a ban makes no sense, because actually it probably does. Guildford High Street has two quite dangerous characteristics for cycling. Firstly it is really quite steep – you would make slow progress up it but inept cyclists or those with poorly functioning brakes might have difficulty maintaining control going down. Secondly the surface is cobbled, with granite setts which get very slippery when wet. I frequently curse the City of London’s obsession with granite setts as “street scene” when I feel my Brompton’s wheels coming out from under me in the rain, so I can imagine Guildford High St could be difficult. Otherwise, on a flat surface I can certainly relate to the observed relationship between pedestrian density and dismounting, as that is precisely what I would do in the circumstances, even where cycling is permitted – after all, when I am not protected by 1.5 tonnes of steel safety cage, roll bars, crumple zones, airbags etc I am probably almost as vulnerable in a cyclist/pedestrian collision as the pedestrian is. I suppose that doesn’t address reckless cyclists, but then our highways system doesn’t really address reckless motorists, does it? Indeed I would go so far as to say that straightening roads and widening the radii of junctions and turns, if anything, encourages them. 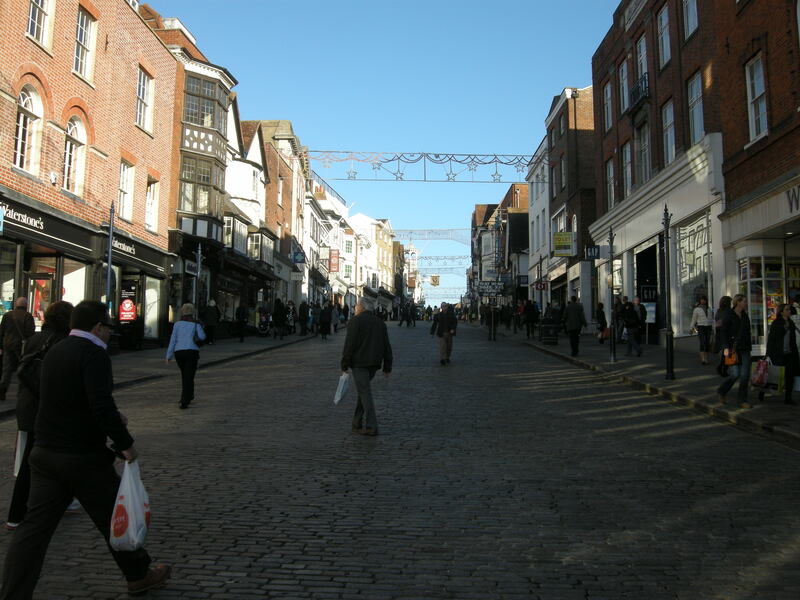 [apologies to people who aren’t familiar with Guildford] But Guildford High Street has no sensible alternative. Thanks to the one way systems if you are heading West to cross the river you have to go down North Street, right along Commercial Rd and then double back along Onslow Street which is a four lane gyratory at this point. This involves going a long way out of your way and taking some very unpleasant roads. Or you have to get off and push past the one-way section of North Street and through other pedestrianised areas. Heading East isn’t as bad as you can go right onto Quarry Street and then up Castle Street, but this is a narrow road with a steep climb and you will almost certainly have cars right behind you. Or you can go along the A322 (three lanes of fast one-way traffic), around a large fast multi-lane roundabout and up York Rad (past a ‘no cyclists’ sign). On top of all this, from 5.00pm (I think) the High Street is open to all traffic and people do not slow down because of the setts. Ideally it would be pedestrian only because of the speed you can reach, but in the absence of any sensible alternative route cyclists really should be permitted. One might even take this discussion a step further. Cycling is illegal on footways that are part of public highways, but this is because of laws dating back to 1835 (well before bicycles were invented) and 1888 (just as bicycles were starting to appear in larger numbers on our roads). In those days, the law decided that a bicycle was more like a carriage than a pedestrian – and this was true, both horse-drawn carriages and bicycles probably travelled at similar speeds, and they had wheels. The 1835 law was intended to keep part of the highway clear of faster-moving things to make walking safer (and, quite probably, to keep the footway less churned up and muddy than the carriageway). I would suggest that were the Highways Act to be written from scratch today, the concept that cyclists should be required by law to ride amongst motor vehicles would never occur. The Dutch agree, and so they provide a separate set of cycleways for bicycles, as well as the footways and carriageways we have in the UK. So, in the UK, I think we should follow the Dutch and have three types of way on our roads (footway, cycleway, carriageway). That solves a whole load of safety and congestion problems, and at the same time the Highways Act could be amended so that bicycles are no longer carriages in the eyes of the law, which would clear up several other legal problems. But, before we have cycleways like those the Dutch enjoy, perhaps we could change the Highways Act anyway? Undo the classification of bicycles as being carriages (and so treated exactly like cars and lorries on our roads in the eyes of the law), and either re-classify bicycles as pedestrian aids, or as a new category called “cycles” that might also include things like Segways, mobility scooters, and other lightweight modes of transport that currently have no place in our highway legal system. Then cycling on pavements (footways) could become legal, and the vast majority of cyclists who already cycle on pavements would no longer be criminals. As this post shows, cyclists automatically adjust their riding style to suit the conditions: we already have millions of pavement cyclists who are causing no real problems for anyone. The main annoyance is merely that they’re breaking the law, which would be fixed by my proposed change. The biggest benefit of undoing the decision to classify bicycles as carriages would be that planners would have to start thinking explicitly about cycling as a mode of transport, instead of just lumping them in with other users of the carriageway. Given that a major factor in collisions is “cyclist moving from footway to carriageway ” which they would have to do at every corner I really don’t think that we should encourage general footway cycling. I know the footway isn’t as safe as a cycleway would be. But for most people, the footway is clearly a whole lot safer than the carriageway: they choose to ride on it even though most people know it’s against the law, and even though they lose priority at every side road and the route isn’t continuous. But I’m not talking about actively encouraging footway cycling, I’m talking about correcting the anomaly in the law that makes a child or adult riding on the footway a criminal. Footway cycling already happens, and for most people is the only way they feel safe cycling on local utility trips. The law as it currently stands makes them all criminals for not riding only in the carriageway. We should stop actively discouraging cycling in this way, just as we should allow people to ride bicycles in pedestrian precincts. I myself cycle, carefully, on the short stretches of footway twice a day doing the school run. This means I’m a regular criminal, just because I don’t want to cycle on the A24 Trunk Road dual carriageway (the footway is the only alternative as there’s no cycleway). If the law was enforced I wouldn’t bother cycling, I’d take the car instead. Sometimes, to be law-abiding, I cycle home on my own using the carriageway. Believe me, the footway is much safer! I’m pretty sure the majority of local utility cyclists would give up cycling completely if they started being penalised according to the law. Luckily our local police are happy not to bother enforcing this archaic law, so we can continue in our genuinely-criminal activities without too much fear of punishment. The medium to long term solution is to both fix the law so bicycles aren’t forced to be lumped in with cars and lorries, and also to build them dedicated cycleways so they no longer have to choose between using clearly dangerous carriageways or illegal footways. What differentiates ‘general footway cycling’ and ‘using shared paths’? Both have the same risks yet one is illegal and the other formally encouraged in the Highway Code. I agree we shouldn’t be encouraging pavement cycling, but neither should we be encouraging the use of shared paths that remove space from pedestrians and give it to motor vehicles. This general concept is very promising as a way of dealing with a whole range of low-power wheeled things -and they are going to increase as more and more drivers get older and become medically unfit to drive. When some activist mobility scooter users start campaigning for safer facilities (and the thought of driving one of those things on many roads is scarier than using a bike), we should be making common cause with them. In fact, I would like to see the CTC, CEGB and others actively representing the needs of mobility scooter users. Would it not create other problems such as then not being able to ride on the road when there was no suitable footway or cycleway available? My preference would be The Highways Act 1835 to be amended, so the objective act of cycling on the footpath which is “by the side of any road” and “set apart for” use by pedestrians only, only becomes an offence if the cycling falls below the standard expected of a competent and careful cyclist. Effectively as per the Home Office guidance. It’s worth mentioning that in Scotland the Land Reform (Scotland) Act 2003 is having a great impact on just this problem. Edinburgh city council has made paths long banned to cyclists open again, and the pedestrianised centre of Glasgow has been opened up to cyclists too. Ah… snap – didn’t see your post about this. “Sometimes you’ve got to be a little bit naughty” – my kids saw the Matilda musical and I quote this when we’re cycling on the footway. We should legalise footway cycling (as in Korea, Japan, etc.) and fix any inter-mode conflicts through design (perhaps taking space from motors). On the TRL study: this shows how few people were injured etc. but what it doesn’t show is the cost of the ban. How many hurt or sick because people aren’t cycling? Much harder to measure but part of any rational case. Darlington is another good example of cycling being allowed in a newly pedestrianised area, after a lot of work by the local cycling campaign and a trial period. As far as I’m aware, there still haven’t been any major issues. 1. Against some commenters. I wouldn’t get in to suggesting that cyclists should be able to use footways. You will end up with typical sub-standard shared use rubbish on pavements besides carriageways. 2. This is a very good post on why cyclists should be able to use (most) pedestrianised areas within reason. Of course, it may not work – i wasn’t too happy with cycle use in the main pedestrian area in Ghent, but that could just be me and it was in the late evening when traffic of all kinds was sparse and swifter. The thing is to give it a go and have a rational evidence-based discussion based on experience. 3. I note that the thrust of the (as I say, very good) post is along the lines of Monderman, shared space etc. * People adapt (risk compensation) to each other. * You can trust them to react to each other in a benign way(providing there is no big potential lethality difference) . Now, I know you’re NOT saying this about motors and cyclists/pedestrians, but about cyclists and pedestrians. But it is along the same lines. 4. There are still problems with the pedestrainised area idea, a legacy of Buchanan after all. Take a look at Lancaster for a bad example. Basically, they are big shopping centres that destroy local shopping nearby and are BIG motor traffic attractors/generators. The main issue for cyclists is what happens in crossing the inevitable gyratories to get to them. 5. Finally, don’t forget that your argument is sensible and logical. Don’t think for a second that the anti-cycling bigots are going to be swayed by it. We may have pedestrianized areas where bikes are banned but for some reason we still allow access for certain vehicles. In Leicester Square you would be stopped for riding a bike but no one bats an eyelid when the bollards lower and a car drives into the square. They are deemed important because they are delivering something but they are often just taxis picking someone up from a hotel. It is implied that car drivers have a right to enter pedestrianized areas and can be trusted to do so whilst cyclists cannot even though the stats regarding injuries would suggest the opposite should be true. It’s also the same mindset that gives us barriers all over cycle routes, because apparently cyclists can’t be trusted not to throw ourselves out of a side road in front of lorries or something, while cars are trusted to be able to follow give-way markings. It all comes down to people on bikes seen as either being incompetent children or criminal scofflaws, opposed to the hard-done-by law-abiding motorist… It’s about time we took cycling seriously in this country. Having spent a good deal of my formative years in Utrecht where the centre is largely pedestrianised, I tend to think it has to be down to volumes at that moment. On a busy Saturday, it’s easier to walk a bike though a pedestrianised area, I tend to lock mine up and walk around, as if I’d parked a car. Mid week, mid afternoon, slowly and considerately and evenings when the shops are closed, it’s a great quiet way. In a city like Utrecht, most of it is pedestrianised or feels that way even where it isn’t completely, you have a large area to walk and cycle and volumes of both are high when the shops are open. It’s lovely and quiet though! Amazing the difference without the traffic noise. In a country like the UK, a much higher proportion of cyclists are on road bikes, but not exclusively. Cycle planning needs to think more about transport cyclists as these are the ones more likely to cycle into town. Making rules and banning cycling just increases resentment, better to assume cycling should be possible and design accordingly. People here seem to imagine blokes bombing down the street, when in reality, if you provide provision, it’s the ordinary shoppers who will be riding around. You don’t see road bikes locked up in town in Ely, they are mainly shoppers. Planners need to think about the actual demographic, which won’t be road bikers. If they provide plenty of cycle parking close to the shops, on those days when it is busy, cyclists can park up and walk around.There’s never enough parking close to the shops in the UK. perfectly legal to cycle on West Street outside normal shopping hours according to both HDC and WSCC. Outside those hours it is a designated cycle route. 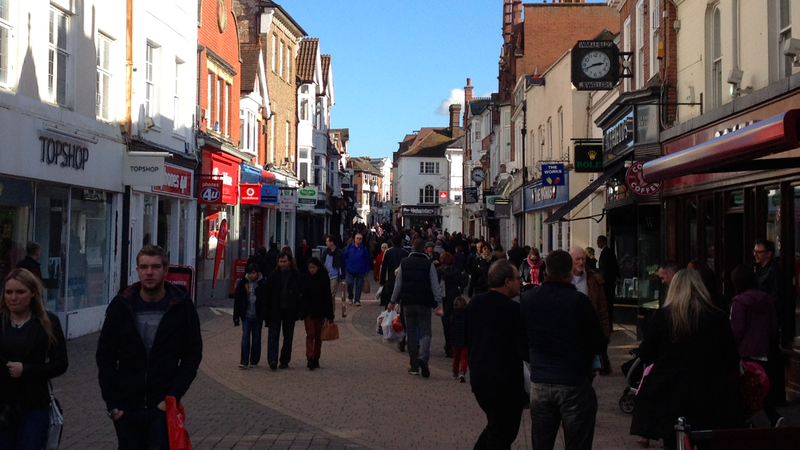 and Guildford High Street can easily top 2000 pedestrians an hour peak time. Unfortunately not, it seems. There is a TRO dating from 1982 that explicitly bans cycling on West Street, at all times. It has never been changed, so the HDC/WSCC map showing cycling was legal at certain times of day was wrong. Helpfully that map has now quietly been withdrawn from the WSCC site! What about for deliveries…In Cardiff, Queens Street is prohibited for cycles at any time but you can drive a 30 tonne arctic down there before 10am if you so choose…I have enquired with the council for the establishment for bicycle delivery there but no budging….It will cost the council by their own estimates several million £ to repave the area due to delivery traffic damage! And just down the road, in the Hayes (very similar pedestrianised precinct, equally busy), cycling is allowed at any time. Yes – pedestrianised Queen Street in Cardiff is effectively a HGV marshalling yard at morning commute time…except not many HGV depots would allow children to wander through on their way to school. The street itself is the only decent link between one side of the city centre and the other for pedestrians and cyclists. I’m amazed (well perhaps not that amazed) that a bike delivery company isn’t allowed to deliver there in those times when an Arctic is – no logic whatsoever in that. Bizzarely cycling does seem to be tolerated on the pedestrianised area on nearby St Mary Street. I bet it’s never stopped the Post Office deliveries. Several points in this discussion interest me. The author is able to show photos of “pedestrianised zones” free of bicycles. In my own town, not one 5 minute period ever goes by any day of the week without at least one, often riding at some speed. On weekends, what look like club groups move through our (“pedestrianised”) broad street en masse. There is a quiet back street just a few yards away, with numerous connecting alleyways, but cyclists seem to be as reluctant to walk a few yards to the coffee shop as modern motorists. As for pedestrian density being the factor that persuades cyclists to dismount, see my other comments*. My impression is that some of our more berserk ones relish the challenge of pushing through. One correspondent above feels it would be just silly to ride through a ped zone which is crowded, yet we have two market days a week * when stalls narrow the space to about 6 feet, but this is exactly what happens. Old people who object are ignored or shouted at. With the current baby boom, it can only be a matter of time before young mums are hit or are forced to jump for it, and note; actual collision is not so much the point – it is the threat that intimidates. Statistics indicating that cyclists just don’t hurt anyone to nearly the same level as they are hurt are fine, but please let’s not omit the actual cases of pedestrian death due to a pavement cyclist; in the latest case I know of (Buckingham), the punishment was a £2k fine. Motorists can get jail for killing, and have to have a piece of paper to show a mechanic checked their brakes. I am not opposed to cycling in particular; all vehicles threaten walkers on pavements and through shopping areas. Simply changing the law to allow cycling everywhere without even the poor sanctions that do exist will give cyclists the impression that they have no responsibilities to insure, maintain, or identify their vehicle, or to accept some instruction in safe and courteous use. What responsible person can object to following the same laws and customs as they expect others to? In addition, there is the regular use of zebra crossings by cyclists who persuade some walkers to step outside the crossing, and use zebras a slip ways on and off the pavement. “Paul” and “Dan Bassford” allude to the loss of space by pedestrians, and that’s exactly what this is. The pecking order precisely mirrors the ability of each “species” to damage the others – HGV > van > car > motorcycle > bicycle > we people, and that’s all that counts in a society where so few are able to ask themselves, “How would I like it, if it were done to me?”. Perhaps the situation will not be clarified until the relative of one of the super rich sues the cyclist. Such people have better access to law than the rest of us. It’s called big money. But, as “RDRF” has already pencilled me in as an “anti cycling bigot”, why not just ignore me altogether? I’d prefer to make policy on the basis of solid evidence about actual risk, benefits and outcomes; not on the basis of anecdotes. Easy Rider, I was telling you how it actually is for pedestrians in my small town. The article included pictures, which anyone can take, and edit to show whatever is desired. It would take an unedited set of pictures from, say, a road traffic survey organisation to count as “data” (the rationalist ambrosia). But let’s “do” rational, for a moment, and forsake mere physical events. Risks, outcomes and benefits are abstract ideas, until stats have time to accumulate. Anecdotes telling of near misses, collisions and any injury or conflict are accounts of what actually happened, but are only data once collected as witness statements, and eventually add up to become stats. Policy ideas are DERIVED from “anecdotes”. That is how I understand The Health, Safety and Welfare etc Act (1974) and its attendant Regulations, which provides a UK law for framing safety policies. Special Regulations on Asbestos, Ionising Radiations, and Substances Hazardous to Health etc all evolved from “anecdotal” accounts of injury and disease. You are now protected from those. Needless to say, vested interests fought every protective measure tooth and nail, until it was realised that allowing greater risk to the health of skilled workers affected profits. Meanwhile, up in Policy Land (Parliament), cyclists are surely going to get the right to roam some day soon, and it’s simply a matter of how responsible you are going to be compelled to be. To repeat: what responsible person can object to following the same laws and customs they expect others to? My vehicle, by law, is insured, regularly safety tested, and identified for all to witness; not so for a bike. I trained and passed a series of tests. Anyone can get on a bike with spokes or brake shoes missing and whizz through a crowded market, down a narrow alleyway, or on a pavement – and, in my experience, some have. “Anecdotes”, may, with a bit of good will, evolve into policy. Perhaps responsibility is the problem. No, I’m afraid that’s completely wrong. To take just one example – asbestos – the reason it came to be banned in construction was not because of “anecdotes”, but because of *actual evidence* that it was harmful to health. A causal connection was established between exposure to asbestos, and pulmonary asbestosis. Whatever it is you are attempting to establish (and I’m not sure what that it is, exactly) requires more than your personal observations about the behaviour of a handful of individuals. Your assertions that someone using a bicycle needs to be licensed, insured and identified need to be backed up by more than just personal opinion – they need to be justified on the basis of evidence about the benefits and disbenefits at a population level. That’s how sensible policy is made – and indeed why people riding bikes are not required to have insurance, or be licenced, anywhere in the world. 1. occupational illness was seen, then investigations followed; finally, the data were looked at to establish we’d understood things correctly. By the time asbestos was banned in construction, it had already been established as a hazard, and measures had been devised to lock it safely into structures until safe demolition became possible – and affordable. Not using it in the first place was adopted after the process of recognising the hazard. 2. I do not need to “seek to establish” that not everyone shares your enthusiasm for cyclists invading pedestrian space – even if you choose not to hear us. 3. Are there more than a “handful” of bad drivers compared with the total? How many IS a “handful”? 4. I pointed out the wide variation in legal and fianacial burdens between road users. I then asked – rhetorically – why you (or any group) feel you are are above the same standards of respect for others that you no doubt hold me to. I never said that cyclist “need” to insured, trained etc – but the rest of us might be safer if you were. Yesterday I saw a cyclist pedal through the pedestrian zone, then use the zebra crossing at one end as a slipway onto the main road, where a car was forced to slow down suddenly for him. Only an anecdote, you understand. But what if there had been a collision? Would blood become real only when you see it for yourself? You BELEIVE in cycling (it’s “sensible”, to quote you) whilst I can see bad consequences from loading the dice in favour of ANY interest group. Policy will be made in favour of whichever interest group shouts loudest at politicians, and you’re likely to win. That’s exactly the point. In a collision between a motor vehicle and someone riding a bicycle, which way is the dice loaded? Which person is more likely to end up seriously injured or dead, and which is almost certainly not going to be injured at all? The dice are currently HEAVILY loaded in favour of motorists if cyclists and motorists are expected to “share” the carriageway as they are expected to in the UK. You don’t have to imagine the bad consequences, you can see them in the daily count of deaths and serious injuries. There isn’t any need to “believe” in cycling, and more than you need to “believe” in walking or motoring or using buses or going by train. They are just modes of transport! I sense exasperation, which indicates “belief” rather than any Swiftian social logic (not that I presume logic is the only path to solution of social problems). Cycling seems to me (*anecdote warning*) to have taken on the shape of the liberation movements I recall from the 1970s onwards (I understand why) ; thus my reference to belief. A sad consequence is that the various sides demonise each other. My concerns are with the pedestrian (like me) finding his terriory being invaded, thus my arguments are not aimed towards favouring motorists. You ALL invade MY space, and there are few voices raised on my behalf. I compare legal obligations just to show the difference between motorists’ mandatory responsibilities and cyclists’, and to introduce the question of how ready all sides are to be equally responsible. I explained my use of “beleive” above. I would add that cycling is NOT “just a means of transport”, but, like Global warning, has acquired a moral status in some minds, based on inferences about use of polluting fuels, noise, “healthy living” etc. My reference to loaded dice is, as you point out, aimed equally in all directions, and, of course, mass and velocity will always win. Ah, I think I understand your viewpoint now. Thank you for making it clear! Yesterday I saw a man running, and knock over a small child. By your logic, we should take immediate steps to ban jogging and running. What the cyclist I actually observed did was knowingly illegal: your hypothetical accident with the man and the child would be just that: an unplanned occurrence with unfortunate consequences. As a matter of interest, one hour ago, I was made to “share” the pedestrian footway with a cyclist who used the ramp at a zebra crossing as a slipway off the road. He missed me by inches. Why the road suddenly became second choice, I do not know, but, clearly, he reckoned that I and the mother and child just a few yards behind would make room. I think this discussion proves that people hold cherished ideas regardless of logic, and that accidents only matter if they happen to “our” group. But do not despair; I am sure your lobby will win. In case you hadn’t noticed, the whole point of this discussion is about whether certain activities on certain streets should be illegal or legal. Stating that cycling is illegal as a reason to keep it illegal is no argument at all. You think cycling should be illegal on a particular street because you have seen an incident. I am simply asking you to extend that logic to an incident with someone running. To be consistent, you should think running should be illegal, if an incident occurs as a result of someone running. If a pedestrian zone is protected by a ‘no vehicles’ sign (red circle) then I am not allowed to cycle in it. If it however has an exception ‘for loading’ would I be allowed to cycle into it if I plan to go shopping and put the goods onto my bike rack?